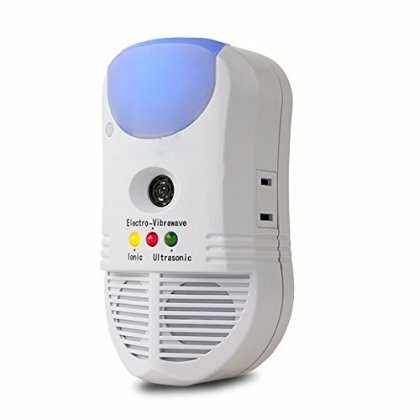 RID YOUR HOME OF RODENTS & INSECTS - protect your home from unwanted pests using the latest ultrasonic electronic technology. NO HARMFUL CHEMICALS OR POISONS - safe and non toxic, will not harm humans or pets. The unit has zero odour and is totally inaudible to humans. No battery required. ELECTRONIC VIBRAWAVE TECHNOLOGY - eco friendly vibrations travel through your wiring to create a giant pest repelling field that reaches deep into walls and cracks causing a shield preventing pests entering the house. Outdoor pests will no longer enter your home. PEST FREE LIFE - Simply plug in this easy to use device and effortlessly repel rodents and insects without ever lifting a finger, drive 'em out and keep 'em out! ADDITIONAL FEATURES - NIGHT LIGHT that lights the room with a gentle glow. IONIC AIR PURIFICATION pumps out beneficial ions that clean the air of pollutants and food odours.